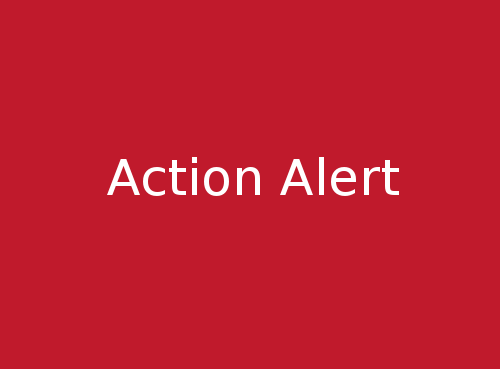 Are you concerned that Extraction is beginning Livingston Pad construction work on February 12, the same day that there is a U.S. District Court of Colorado hearing to continue the motion for a temporary restraining order by the Wildgrass Oil and Gas Committee (WOGc)? Are you concerned that the State is prioritizing oil and gas industry profits over property rights? Please consider writing/phoning state and local officials to express your concerns, using the contact information below. 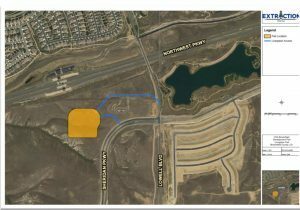 According to a February 9 announcement on the Broomfield Oil and Gas webpage, Extraction will begin Livingston Pad construction and access drive work on February 12 that will continue through March and into April. Please read the entire announcement here and see the list of initial operations below. During the WOGc lawsuit hearing on Friday, February 8, U.S. District of Colorado Judge R. Brooke Jackson was surprised to hear that Extraction pipeline construction was well underway and that Livingston Pad construction was scheduled to begin shortly before completion of the forced pooling process. Through forced pooling, the State of Colorado will force mineral owners to sign over their property rights to a private corporation and Extraction will then have control of all the minerals in the Lowell South Spacing Unit of the Livingston Pad. The WOGc lawsuit claims that forced pooling is unconstitutional. Judge R. Brooke Jackson seemed perplexed when WOGc witness Ann Marie Byers testified that Colorado Oil and Gas Conservation Commission (COGCC) rules allow the operator to drill the wells before mineral owners are force pooled. At that point, he asked, “What happens if they started drilling and I rule here that Extraction should stop?” He noted that Extraction had a lot at stake in the proceedings and asked, “Why is Extraction not here?” Colorado Solicitor General Eric Olson replied that Extraction declined to be part of the proceedings. 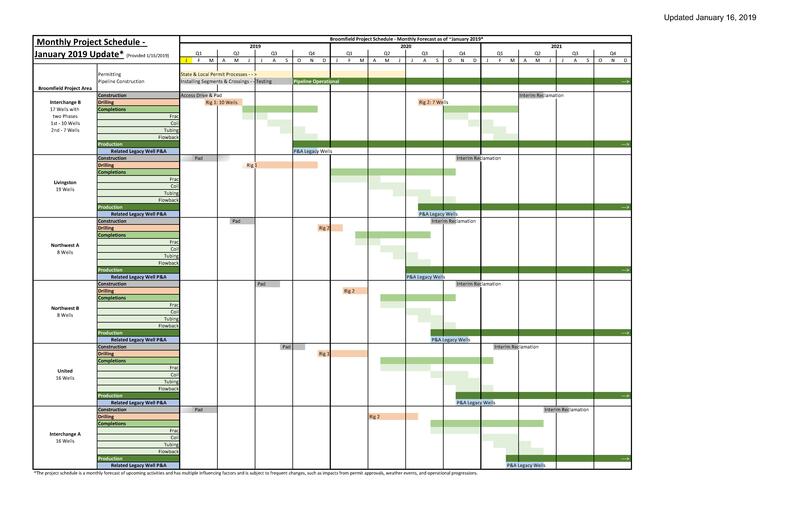 The hearing is being continued on Tuesday, Feb. 12 at 11 a.m.
You can see the latest Extraction schedule here and below that the City received on January 16. 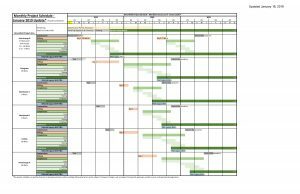 In the February 6 Broomfield Oil and Gas Update, it states that “construction of the Livingston Pad will begin in early February and drilling will begin in June” but it did not state an exact start date as did the February 9 posting. The City had previously stated that the Operator Agreement (OA) with Extraction was meant to help ensure residents’ safety by requiring Extraction to prove it could operate safely on the Interchange Pads before starting on the Livingston Pad. However, the OA does not state the precedence for construction of the pads but only for drilling. It is not clear what power the City will have retroactively to enforce any necessary construction modifications on the Livingston Pad related to drilling problems discovered on the Interchange Pads. Note: The Feb. 9 City announcement for Livingston Pad construction states that residents should call Extraction with questions.